So it's already started! The Holidays are among us. Thanksgiving has already ended for my Maltese Maniacs in the US. Christmas, Hanukkah, Kwanzaa, and New Years day are just around the corner. I hope everyone is able to spend time with their loved ones, especially their Maltese. Let me know how you are celebrating! When you train your Maltese you should aim to use an “authority” tone of voice. Think of how a school principal might talk to a student. You want to be encouraging, but also firm – your dog must know you're in charge. You're not asking her to do what you want, you're telling her. This firmness is critical if you want your dog to follow your commands consistently. Click here to learn ways to train and care for your precious Maltese. Get beautiful 2015 Maltese dog and puppy calendars for up to 50% off. Make a masterpiece out of your favorite Maltese photo for 50% off. Customize a shirt, coffee mug, iphone case - almost anything for 30% off. PetFoodDirect is a great place to get yummy treats, toys and even clothes. Get 18% off $89+ with coupon code PFD18 plus UP TO 60% OFF when you shop BLACK FRIDAY sales! For everything else try Entirely Pets. Their sale is for up to 70% off. Ok, that should get most of your shopping done. Good luck and let me know of any other deals you come across that your fellow Maltese Maniac's would like. If you are looking for a gorgeous Maltese, you don't need to spend thousands of dollars on one. 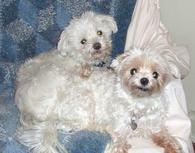 Many rescue groups rehome retired Maltese from breeders of champions. To find these dogs, just contact your local Maltese rescue group. Click here to see a list of Maltese rescues in your area. I'm constantly adding new content to the site and would love to hear any feedback, good or bad. Please don't hesitate to contact me! If you find this newsletter useful, please feel free to recommend it to a friend. Let's continue to grow the Maltese Maniac community together!